and I was ready to decorate! The best part! and shims for the shutters and the steps. All the new wood was painted with a vinegar treatment that gave it the perfect aging. and then cutting it with a decorative edge. I used a rusty spout from an oil can. I hope the birds will love it as much as I do! Susan, Love the old birdhouse. Love all the items you used to embelish it. Great job. Too cute for the birds (ha) Have a Sunny Sunday. Wow! That certainly is creative. I hope the birds like it, too! 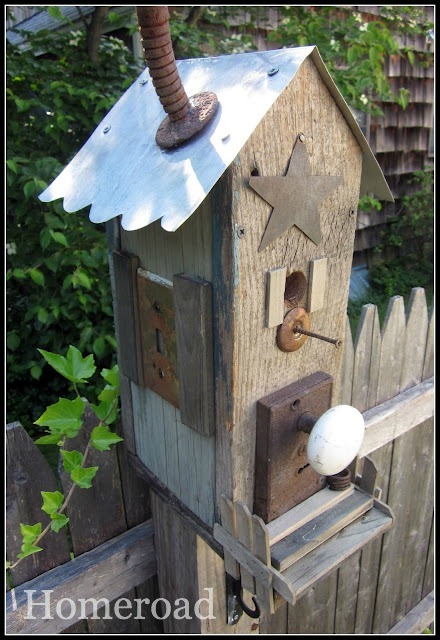 Oh my goodness, such a cute birdhouse! You've done such a great job, looks wonderful. That is so adorable! I love that you've used hardware for the features, it makes it extra stylish! I'm sure the birds love it! Your birdhouse is darling! As the others have said, it's the little "extras" that make it so special. 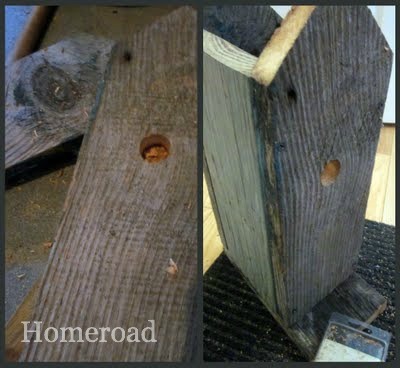 Seeing projects like this makes me want to get comfortable using the table saw and other power tools, instead of waiting for man to to get around to the "honey do" list. but first I have to get all of MY junk out of the way in the garage... :-) Glad to have found your blog! Ok, this is just too cute!!! Great job!!!! that house is very creative and I just love it! I love the idea of ​​recycling a lot of art in their work, congratulations! That looks great! I love all the things you added to it. Great job. Love the birdhouse!! I'm sure the birds will love it too!! Very cute! I love birdhouses and you did a great job on this one. Love, love it! I have a ton of birdhouses, but didn't make a single one. You've inspired me! This was ingenious! And really beautiful, too! Fabulous work! I do really like it! I am sure it looks fantastic on your garden. It is a great, different idea. Thanks! I thought this was such a great project... I totally voted for you, good job! I am a new follower! 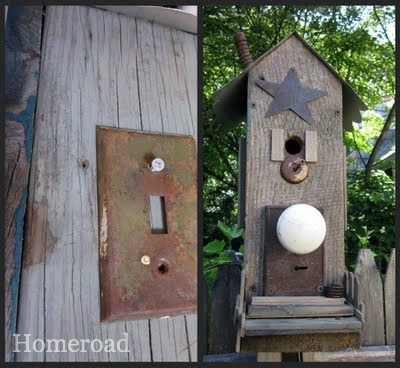 Oh how I love me a birdhouse...especially the junky kind. Yours is fabulous! I also like the coil pot on the front step. You did not miss a detail! If I knew this was being done with the "borrowed" wood from my pile I would not be sorry at all. Your birdhouse is ADORABLE! What a fun way to use up neato rusty pieces! It's fantastic. I love how rustic it is. If you have a moment, I would love for you to share this project on my Inspiration Board. Love the birdhouse, really creative.